Hostess gifts for summer travel. But I’m keeping some for myself! It’s looking like full-time crafty Christmas around here! Baby Daphne has started removing tags from gifts and either eating the tags or sticking them to the hardwood floor. Not helpful. Let’s just hope that if any of the gifts end up with the wrong recipients, they aren’t awkward and can be easily switched back! 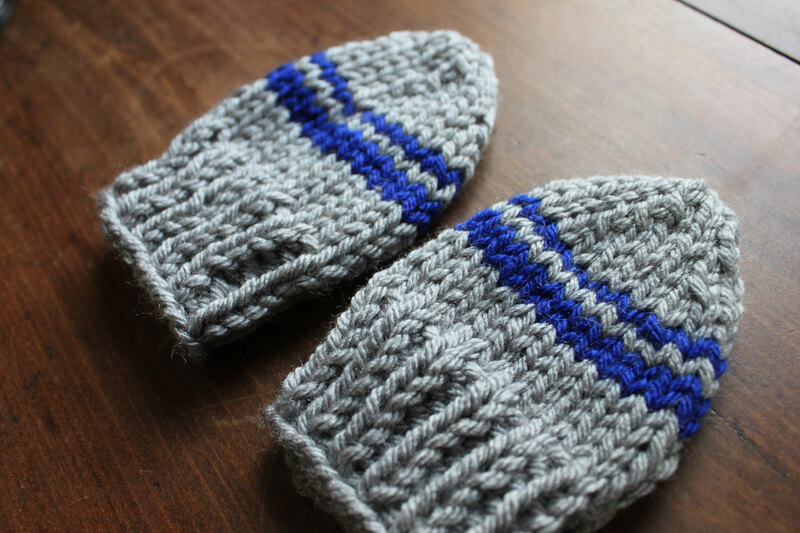 For example, anyone over two would surely be disappointed to receive these tiny mittens I knitted. My kids made snowflake ornaments out of craft sticks to give as teacher/leader/coach gifts. 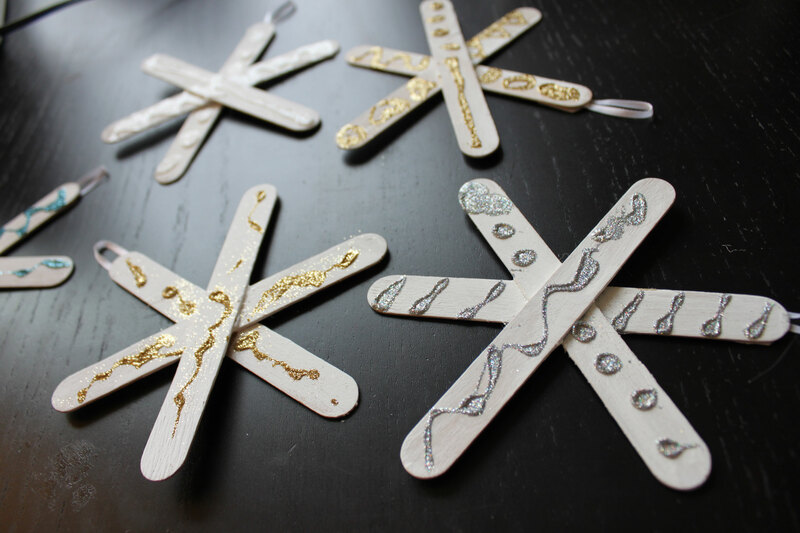 Using glitter with children is something I try to avoid on principle, but it went pretty well and I self-medicated with cookies after it was over. This is the annual batch of homemade unscented soap for my brother, and another scented batch I made for myself and to share. I used cold process recipes from the book The Everything Soapmaking Book. I like to try different recipes every year, which is really completely useless unless I make a batch for myself because I’m sure my brother has no notion or opinion about the benefits of tropical oils versus olive oil, lard, or soybean shortening, though I think he appreciates the soap. This year’s batch is a blend of four different oils with some castor oil stirred in at the end for extra moisture, and mostly lavender scent in mine. Now it is curing in the basement playroom and makes the whole space smell nice! We did some early Christmas unwrapping today, allowing the kids to paw through the little items that were from their parents, as opposed to the more mysterious gifts that will come from St. Nick tomorrow. I made the kids these canvas art smocks/aprons to wear during their own crafty pursuits. Dorothy had a tiny little painting smock when she was a toddler but it long ago lost its straps and fell by the wayside. My method of keeping the kids clean during art projects has been to send them upstairs to change into old t-shirts when I think about it, but that’s rather inconvenient when one has been hit by inspiration. These sturdy canvas smocks should allow them to act on their inspirations without the burden of climbing two flights of stairs and locating an acceptable shirt. I used fabric paint and freezer paper stencils to paint their initials onto each apron. Of course unwrapping the smocks caused inspiration to hit immediately, so we had to pull out paints and brushes and canvas boards to try them out. I made these “favorite newspaper” cufflinks for Rob. He likes novelty cufflinks to lighten up his stuffy lawyer garb and we’ve had fun in the past gluing Legos and bottle caps onto cufflink hardware. This year I used a 1-inch round craft punch and epoxy dots to make cufflinks from his own used newspapers. I punched clear plastic (like from the packaging of new toys) for the backing. 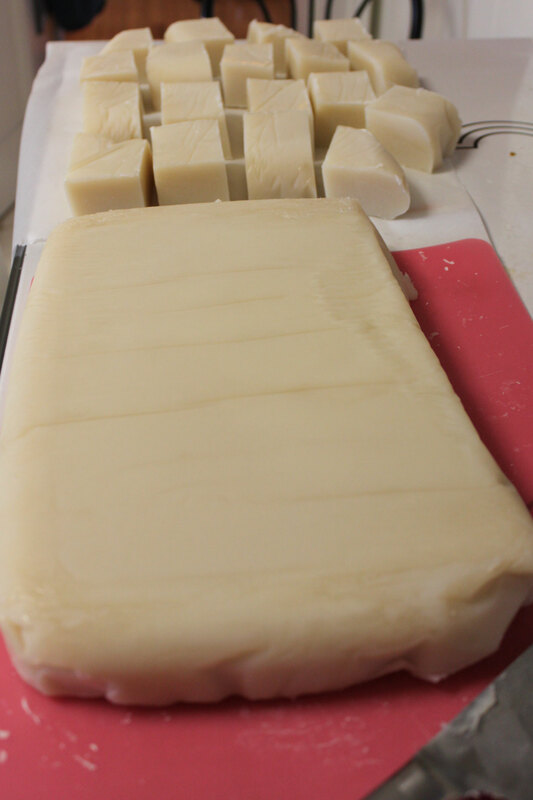 And this is a brand new batch of cold-process (lye) soap. I make unscented “man” soap for my brother whenever he starts to run low. He likes a soap without weird chemicals or fragrances and I like the opportunity to make something handmade for a brother who doesn’t need much. This soap will come out of my extremely expensive and fancy (ha!) dishpan mold later today and I’ll cut it into slabs before I give it to him tomorrow. It will still need to cure for 4-6 weeks, but if I give it to him straight from the mold then he will be able to cut it into just the right size bars himself.